If you visit the Google home page today, you may see Google's logo has been taken over by a bunch of stripes. Those stripes are actually a bar code, and when you convert the bar code to english, guess what it means? You got it! It means Google. There is a lot of discussion and questions around this logo. We have threads at WebmasterWorld, DigitalPoint Forums, a few at Google Web Search Help, and Google Webmaster Help. My Google Icon has turned into a BAR CODE for some unknown reason. What has happened and how to correct. 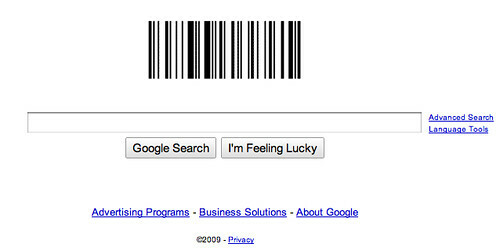 Out of nowhere today, 7 OCT 09, the Google logo shows up as a barcode on the homepage. Any fixes? Truth be told, today in 1952, the US Patent Office issued a patent for the bar code. You can see the patent over here. Forum discussion at WebmasterWorld, DigitalPoint Forums, a few at Google Web Search Help, and Google Webmaster Help.